Sometimes when we are filled with joy and happiness smiling is the most natural thing and a smile comes onto our faces without a thought and with no effort at all. Other times, when we are upset, angry or stressed a smile seems foreign and is far from our minds. Other times, mostly when we are concentrating on other things (like when we are working out) we simply forget to smile, and that smile, when we remember to do it at those times can make a big difference. Recently, I was fortunate to travel with my husband to Bali and the Gili Islands. While there, I went to a couple of yoga classes. One of the yoga classes I went to reinforced something I have known to be true, smiling makes everything better! 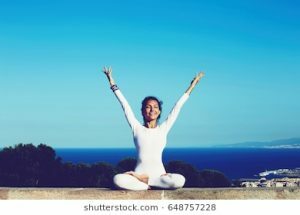 During this particular yoga class we started with a guided mediation connecting with our breath – concentrating on deep, even inhalations and exhalations, watching it flow in and out while our eyes were closed. Probably sounds pretty familiar, right? If so, I am sure you probably have had this experience on the mat when your mind clears and all you are concentrating on is your breath, a truly powerful and beautiful experience. Now, imagine what your face looks like. If you are like me, your face is probably relaxed, even slack as you sink into a meditative state. What was different about this particular yoga class was that as this was happening (and throughout the entire practice) the instructor kept reminding everyone to smile. I can’t speak for everyone, but for me in this deep relaxed state the experience of bringing a smile to mind and onto my face was both simple and profound. I really did feel a positive shift and noticeable uplift of my mood. I wasn’t not smiling before because I was unhappy, in fact, I was very happy, I simply was forgetting to smile. A smile is a truly amazing and powerful thing. It is contagious, beautiful and simply fun to do. 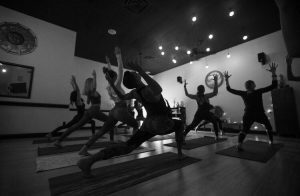 Science has shown that the mere act of smiling can lift your mood, lower stress, boost your immune system and possibly even prolong your life… in a lot of ways, isn’t that why we go to Yoga Time Studio and practice yoga and barre? I’m not saying you should be forcing a fake smile throughout your down dogs or grinning through every chateranga, but it can be a useful tool when you need a mental break like when your legs are shaking during a hard barre workout or simply a positive reflective practice when you are breathing gratitude in and out during a meditation. Taking time for yourself to better your body, mind and spirit during a yoga or barre class is a positive thing and hopefully something you feel good about doing, so why not smile about it? The next time you are gritting your teeth through a hard barre workout or intense yoga posture, why not shift your mental attitude and remember how lucky you are that your body can move and that you took time to be there – and smile! Next time you are meditating on the mat and breathing deeply in and out, reflect on the beauty of that experience – and smile! I’m sure everyone is different and it might not be for everyone, but it’s worth a try. So, whether you are on (or off) a mat in Bali, Purcellville or anywhere else in the world, remember to smile!